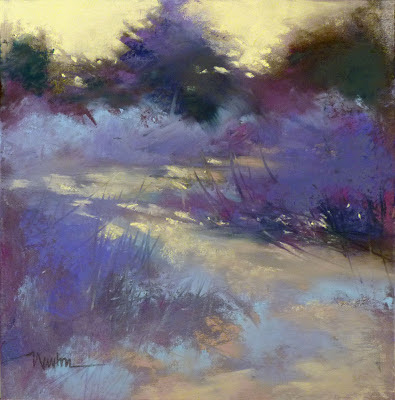 Five artists joined me for my two-day plein air pastel workshop, Landscape Impressions 2013. We had gorgeous weather for what might become an annual event - it was fun to teach again. Click on the above image to see two students hard at work. Below is my demo from the first day, tweaked extensively that night back in the studio. Warming up for my Landscape Impressions workshop next week. 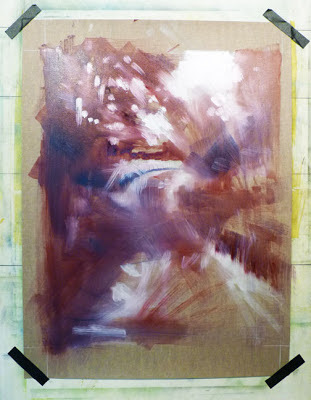 The first step is an acrylic underpainting. Pastel painting of our little pond...the IMPRESSION of our pond. My last post was about painting from memory. The painting above left is a memory painting; the one on the right was painted from a reference photo. Is one method of working more valid than the other? I'm excited about what happens to a scene that has been processed through my memory. This morning, I found an appropriate quote (funny how that happens). "I never succeed in painting scenes, however beautiful, immediately upon returning from them. I must wait for time to draw a veil over the common details." This week I painted from memory. 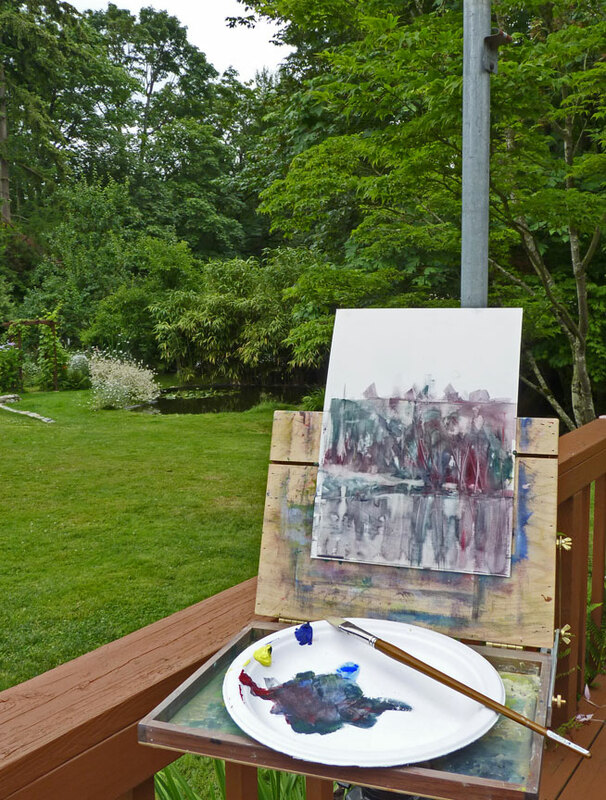 No reference photos, no plein air painting. It was freeing and exciting and was reminiscent of the year or so I spent on abstracted work. Very fun. 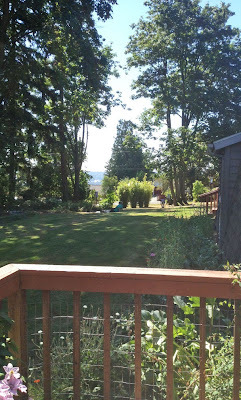 I focused on the nuance of a memory-scene and stopped before my usual addition of details. The photo above will give you an idea of the paintings (sorry about the reflections, especially on the center one). I found a way to trick myself into stopping before the urge to add detail takes over: I selected four older paintings, and each day I took one of them out of its frame, repainted a scene from memory, stopped BEFORE I felt I was done and put it back in the frame. My thought was that I'd just look at them for a while then unframe them, paint a little more and photograph them. However, once one was framed and I went on to the next, I began to forget what I was going to "fix" and now I'm happy with them just the way they are. Certainly happier than I would be if I had overworked them. Today's painting, "Bejeweled," was a different story. I painted it once yesterday, wiped it off. 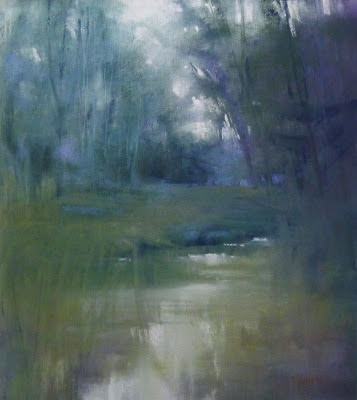 Painted it again this morning, began to photograph it, then fixed one little thing...then another...wiped the whole thing off and painted it again this afternoon. Now it is sitting in the frame while I think about it. If it survives, I'll post it soon. I've had a happy painting week. Good days in the studio! I think I have a "nuance" series going on here in pastel. Minimum detail - loving it. More playing in the studio. Another 7.5 x 7.5 pastel in cool colors on a warm day. 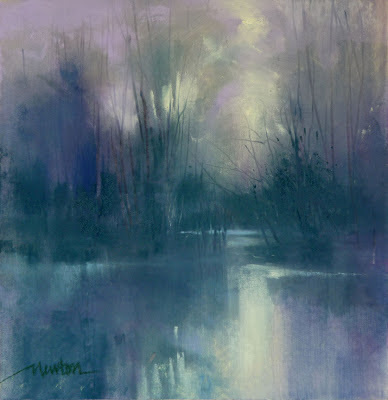 Soft focus, loose, interpretive with minimum detail. To fill requests of the galleries who kindly represent me, the first half of the year has been spent painting more of the kind of work they have been selling for me. But these days, I'm painting for myself in preparation for a two day workshop here in my Studio July 22 and 23. By the way...a recent cancellation has made room for one more student. If anyone is interested, just email me. 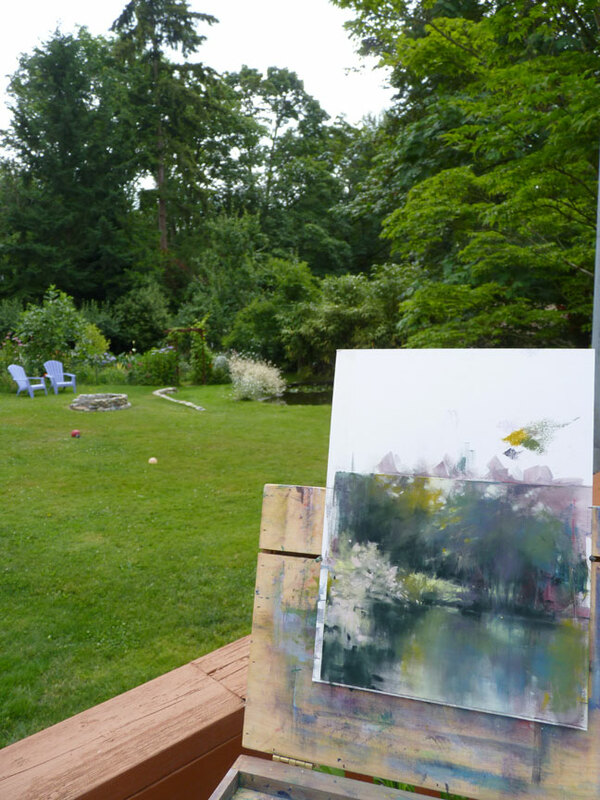 We'll be painting in pastel, plein air I hope, depending upon the weather. For the rest of the summer, I'll be painting the more impressionistic work I love - more fluidity, less detail. Several years ago, I loosened all the way up to abstracted landscapes and that was fun! 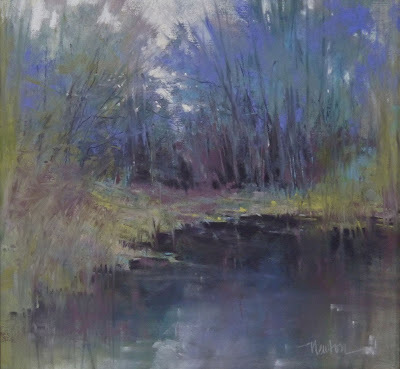 For now, small pastel studies (and an occasional oil) so I am prepared to give students my best advice for lively work of their own. Journey by Heart is from memory...no reference photo to tighten me up and nail me down to specifics. After early-morning watering of the flower gardens and blueberries, I closed the windows and doors against the heat and spent the rest of the day in the studio. 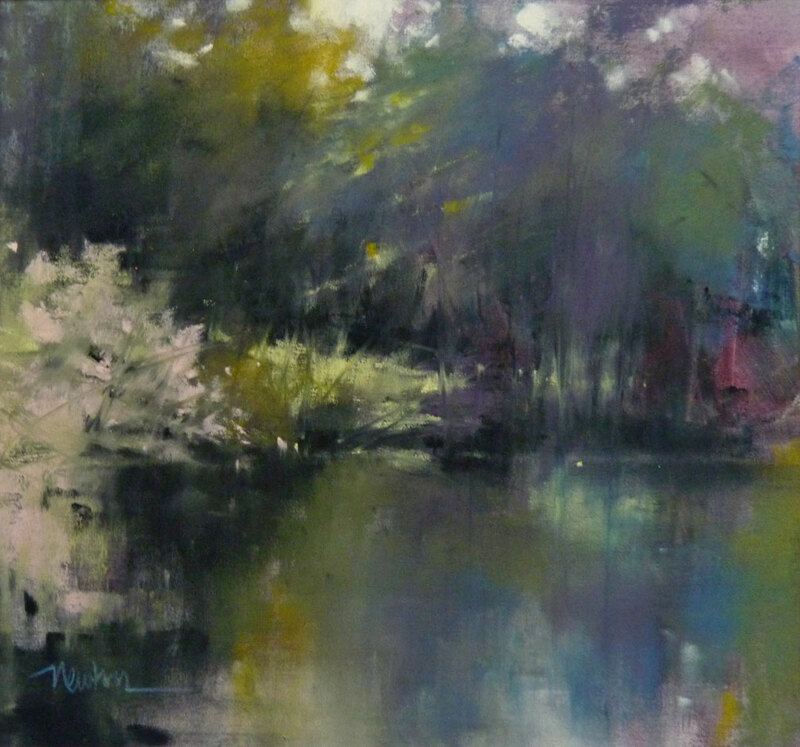 The colors of this painting kept me cool all day. There is a backstory here that I hope to share in a future post. 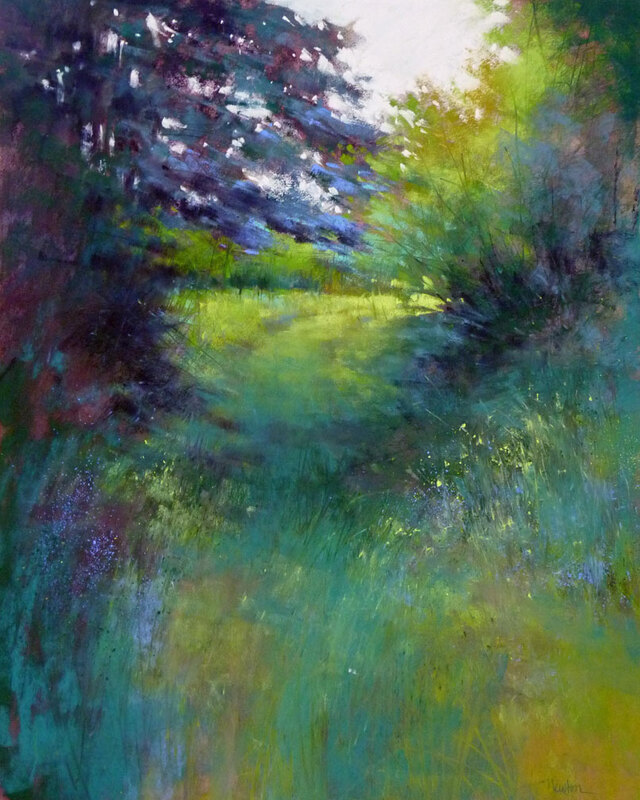 An overgrown driveway not used for years and still lush from pre-summer rains; the tentative title of this one has been replaced with "Long Time Passing," pastel on Wallis paper, 20 x 16 inches. An early start in the studio this morning on a new pastel, tentatively titled "Forgotten." 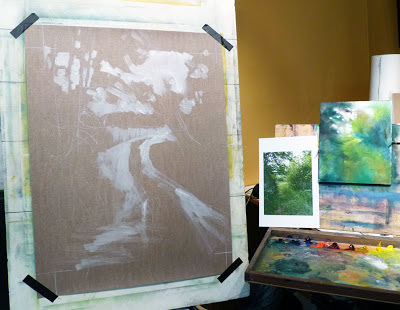 Shown here are the two steps of the under-painting in oil on Wallis sanded paper, Belgium Mist. The painting will be 20 x 16 inches.